Differentiating between the plants in a closely related group can feel similar to being an outsider attending a large family reunion. Identifying who's who and how they are connected is a challenge. That's the way it is with Mexico's Roseleaf Sage (Salvia involucrata) Group, which is well loved by hummingbirds. Ruby Throated Hummingbird on Salvia "Mulberry Jam". One thing that may be confusing about the various cultivars and hybrids in the group is their abundance of puffy, tubular, magenta flowers. Look at them just so and you might imagine tiny fish, with fantail corollas, diving into the cup-like calyxes supporting the flowers. The blossoms of these species emerge tightly furled similar to rosebuds. They're protected by involucres -- the source of S. involucrata's name -- which are leaf-like bracts that fall away as the flowers begin blooming. So being in a cloud forest full of these plants is a bit like being at a family reunion where everyone has the same haircuts and hair color. Don't give up on getting to know them. They are pretty and a joy in the wildlife garden. We promise to do our best to provide introductions to the Roseleaf relatives in our catalog. But before we give you a list, some explanation about the group and its origins is in order. When crosses occur easily between certain species within a genus, such as Salvia, it's often the case that the species are native to the same region. Also, if there are a number of species in an area that freely hybridize, it's common to refer to them as a group. Salvia involucrata is unique to the cloud forests of Mexico's eastern states of Tamaulipas, Puebla and Veracruz. The Roseleaf Sage Group is comprised of S. involucrata, its cultivars and the hybrids it forms with other sages that share eastern Mexico as common ground. Altogether, their U.S. Department of Agriculture cold hardiness ratings range from Zone 7 (a winter low of 0 degrees F) to Zone 11 (40 degrees F). Wagner's Sage (S. wagneriana) from southeast Mexico to Central America, including Panama. The group is comprised of shrubs and subshrubs, which are sages that combine woody and tender herbaceous growth. Although sizes of the different species vary, overall these are large sages. Most thrive with average watering based on local conditions, although love ample moisture. Almost all prefer well-drained, fertile garden loam in full sun to partial shade. Fall through winter into spring. It's fair to say that the Roseleaf Sage Group is a bit randy. In particular, the Salvia Study Group of Victoria, Australia, calls the relationship between S. involucrata and S. karwinskii "promiscuous," because they hybridize so easily. At Flowers by the Sea, we only carry one sage clearly identified as an S. involucrata/S. karwinskii hybrids, and it also includes Autumn Sage (S. greggii) in the mix. That's Brent's Fall Hybrid Sage (S. greggii x karwinskii 'Brent's'), which is startling because it raises such a short species (Autumn Sage) to lofty heights of up to 60 inches when in bloom. Imagine the potentially gargantuan results of hybrids solely between S. involucrata and S. karwinskii considering that Karwinski's Sage tends toward heights of 10 feet or more. Although the flowers of Karwinski's Sage usually are red, those of the San Francisco cultivar Giant Karwinski's Sage (S. karwinskii 'Ted's 18 Footer') form a tower of pinkalicious power that make us wonder if Roseleaf Sage played a role in its development. But it's often difficult to discern the entire parentage of hybrids found in the wild or that have occurred as accidents in nurseries or backyards. Until DNA analysis of plants becomes less expensive, growers will just have to be satisfied with their suspicions. The roots of the Roseleaf Sage Group's horticultural record are also tangled. The first species in the Roseleaf Sage Group to receive a scientific name was S. involucrata. According to various scholarly studies, its horticultural history dates back to the Royal Botanical Expedition to New Spain (1787-1803), which was funded by Spain's royal family to explore Mexico for floral riches, including medicinal plants. The expedition was one of a number of botanical forays into Spain's Latin American colonies in the late 18th century. Aside from acquiring new species for the Royal Botanical Garden of Madrid, the goal of this particular expedition was to establish a similar garden in Mexico City yet based on native plants. This quest is often referred to as the Sessé and Mociño expedition, because Martín de Sessé y Lacasta and José Mariano Mociño led it. Meanwhile, in 1789, self-trained botanist and taxonomist Antonio José Cavanilles had just returned to Madrid after escaping the French Revolution. Cavanilles had trained for the priesthood, but worked as a tutor for the children of royalty in France. Both occupations were strikes against him during the revolution. In his essay Of Dahlia Myths and Aztec Mythology, garden writer Martin Kral notes that Cavanilles subsequently spent his time at Madrid's Royal Botanical Garden classifying plant specimens from the Sessé and Mociño expedition. The U.K.'s Kew Royal Botanic Gardens notes that, in 1793, Cavanilles was the first to publish a scientific name for Roseleaf Sage, which he titled S. involucrata. It's reasonable to guess that the specimen came from the Royal Botanical Expedition to New Spain. However, more evidence exists indicating that someone in the Sessé and Mociño team collected the plant, because in 1892, the same species was published as Salvia ventricosa Sessé & Moc., indicating that the explorers had given that name to the plant. In his 1997 report Type Material from the Sessé and Mociño Collection in the Royal Botanical Garden of Madrid, University of Honduras botanist Cirilo Nelson Sutherland noted S. ventricosa as part of the collection and that American botanist Carl Epling (1894-1968) had corrected the name to S. involucrata in 1936. Epling remains a dominant authority on the mint family (Lamiaceae), which includes the Salvia genus. Species sometimes accidentally acquire a number of synonyms due to lack of awareness of a previously existing name or lack of timely publication of the synonymic names. This was especially true in the late 18th century when researchers in the field didn't know what was happening back in their homelands. But it's clear that S. involucrata was not only the legal name for the species but also its well established title by 1828 when the Rev. William Herbert invited Curtis's Botanical Magazine to view his "twelve to fourteen feet high" S. involucrata in the conservatory of his home in Spofforth, North Yorkshire, England. 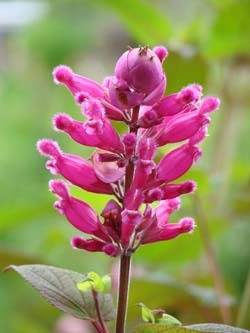 Curtis's described the plant's flowers as "scarcely less beautiful than those of the well-known Salvia splendens." These days, many gardeners invite visitors into their yards and conservatories via social media. Visiting the Hummingbird Forum, we encountered a May 2015 posting by one of our favorite nature photographers, Bud Hensley, who wrote about hummingbirds visiting Mulberry Jam Roseleaf Sage (Salvia x 'Mulberry Jam') as soon as it bloomed in his garden. There are scarcely less beautiful Salvia or hummingbird photos than Hensley's and scarcely less effective ads for the charms of Roseleaf sages. Here is the list of sages promised at the beginning of this post and organized by bloom season. We've provided some important details for differentiating the various species and included some history where possible. Flower color is only included if it isn't pink. Think of this article as helping you to take a breath and relax as you enter the family reunion of Rose Leaf Sage relatives. It doesn't answer all the questions you may have about their connections, growing conditions or role in your garden, but it's a start. We thank North Carolina Salvia specialist Dr. Richard Dufresne for his help with Rose Leaf Sage Group history. If you are puzzling about these species or other plants in our catalog, please call or send us an email. We'll do our best to explain who's who, what's what and how to cultivate success in your garden. Annual pruning to shape and stimulate fresh new flowering growth.